Love to hit the street and skate? 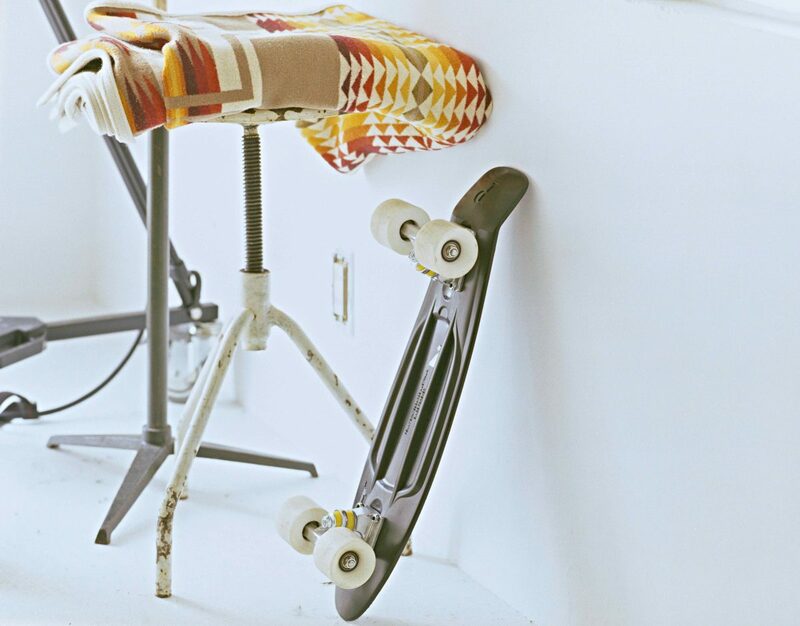 Whether you use a longboard to commute to work, a penny board for fun around the neighborhood, or you pull tricks regularly, you’ll need somewhere to store your board when it’s not in use. Sure, you can prop it against the wall in the garage or in the front hall, but what if you have more than one board? Few skateboarders only have one board – you probably have a different setup for different needs, and those boards take up room in your home. The answer is a skateboard rack. These racks are designed specifically to keep your boards organized and out of the way. We’ve searched the market and found the 10 best skateboard racks for 2018. Below, you’ll find a head-to-head list to make comparing your options simpler, but we also provide more in-depth reviews later in this guide. Finally, we’ll wrap up with a look at some of the most important considerations to make when choosing the best skateboard rack for you. With our quick head-to-head review over, it’s time to move on to more in-depth reviews of each skateboard rack on our list. You’ll find that each brings something else to the table. The top skateboard rack on our list, StoreYourBoard’s all-black rack is stylish and modern. Made from ABS plastic and featuring I-beam construction, it’s also surprisingly durable. If you were put off of plastic racks because you think they’re not as durable as other options, think again. This rack offers plenty of strength and durability. It’s also quite versatile, and can hold your boards and boarding gear if you only have one or two boards. 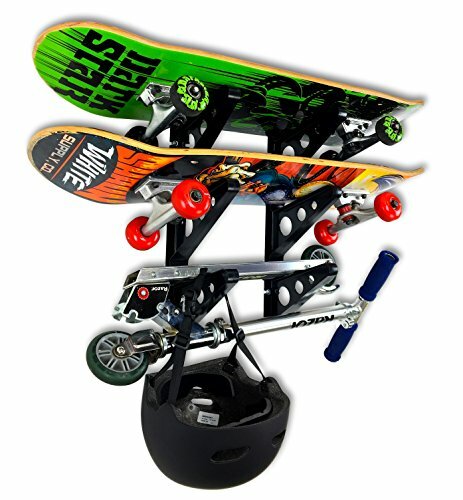 The rack offers the ability to store up to three boards, or a combination of boards and riding gear. The system is designed to mount to the wall, and requires only a few screws to anchor in place. The two uprights can be positioned as close to or as far from one another as you like, allowing you to create a custom storage solution for your boards. The 212 Main display offers all-wood construction and a lot of beauty. The wooden pegs can easily hold helmets or boards (or other riding gear if necessary). 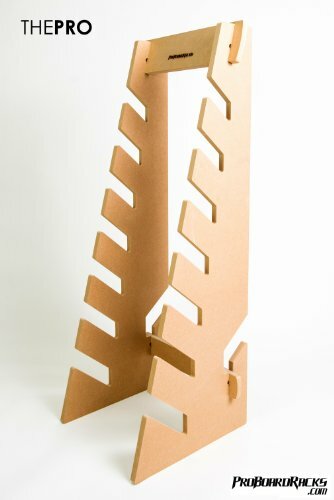 The 212 Main wooden angle skateboard display rack is designed to mount to your wall, and requires just two screws – one at the top and one at the bottom. For the best security and stability, it is recommended that the anchor screws be embedded in a wall stud, or that sheetrock anchors be used to ensure stability. The frame and dowels are all made from solid birch for long lasting beauty and performance, and the edges have all been sanded for a professional look. This rack offers enough space for four boards (of any length/width) or a combination of boards and riding gear. Note that boards can be stored with or without trucks and wheels. 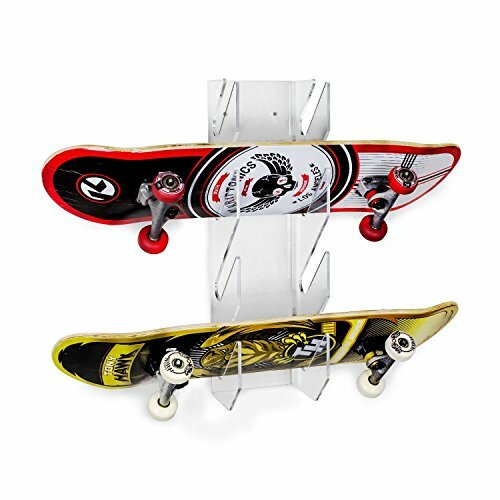 Designed and manufactured in Colorado, The Pro skateboard/snowboard/longboard display rack is meant designed to work with just about any type of board you might have. 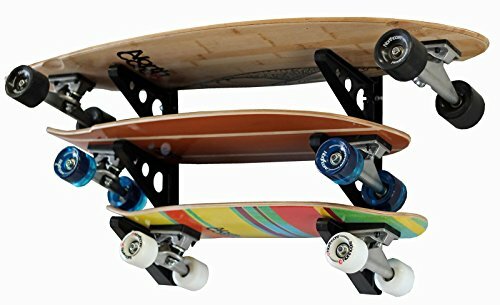 Whether you’re a dedicated penny boarder, a snowboarder, or you love to cruise downhill on your longboard, this rack offers you the mean to get your gear up out of the way and to display it in an attractive way. This system is designed to sit on the floor, so there is no need to hang anything on your walls. That makes it perfect for apartments or other areas where wall-mounting might not be ideal. It also goes together very easily – one crossbar at the top and bottom is all that’s necessary to install. The Pro can handle up to seven boards at a time, with or without trucks and wheels. Note that this is a floor-based system, so you will need enough open floor space for it. The StoreYourBoard Wall Rack is designed primarily for use with longboards – there’s more than ample room for up to three of them on this storage system. Like the regular wall rack, this one is made from heavy-duty ABS plastic with I-beam construction for outstanding strength and durability. It requires very little to install – just two screws per upright and you’re on your way. All the mounting hardware you need is included, too. Don’t need storage for three boards? No problem. You can hang your helmet and other riding gear from the unused pegs. Note that while this system is designed primarily with longboards in mind it can actually fit just about anything you might have, all the way down to the smallest penny boards. 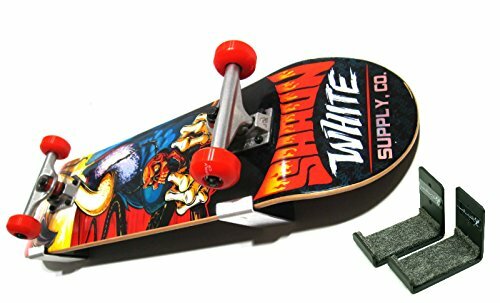 It will also fit all of your boards with or without the wheels and trucks, making it a great solution for works in progress, or completed boards. Love the way a longboard performs? Itching to get your cruise on? If so, the Pro Board Racks Longboard Wall Rack gives you the storage space you need for your boards. It can hold up to five boards, and you’ll find that even monsters fit within its slots easily. 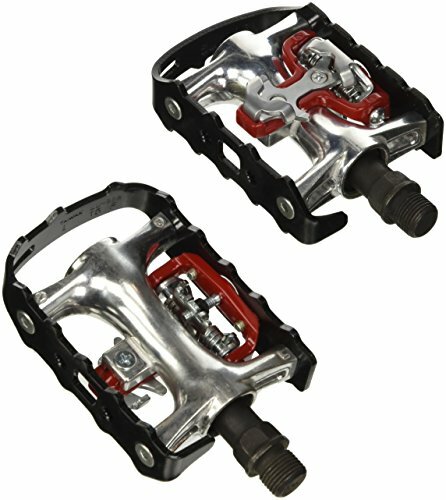 You can store boards with or without trucks and wheels, and keep them out of the way and protected. This rack is also designed and manufactured in Colorado, making it a product of the USA. It’s made from 100% southern redwood for outstanding durability and solidity – this is thick wood that will stand the test of time and look great doing it. It measures a full 47 inches from tip to tip, and requires just a few minutes to mount to your wall. The manufacturer also includes all your mounting hardware. Note that the wood is sanded, but not stained. You can use it natural, or you can stain it another color. 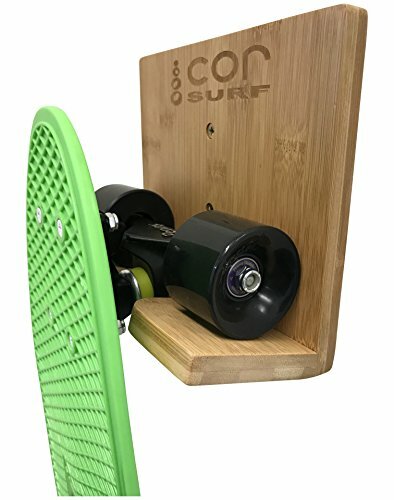 Simplicity has its perks, and the COR bamboo skateboard wall rack shows you why that is. Whether you have just one board that you want to display or get out of the way, or you’re looking for a unique way of displaying boards one at a time, this is the solution for you. Made from real bamboo and carrying a full lifetime warranty, this rack mounts to the wall with just a couple of screws. 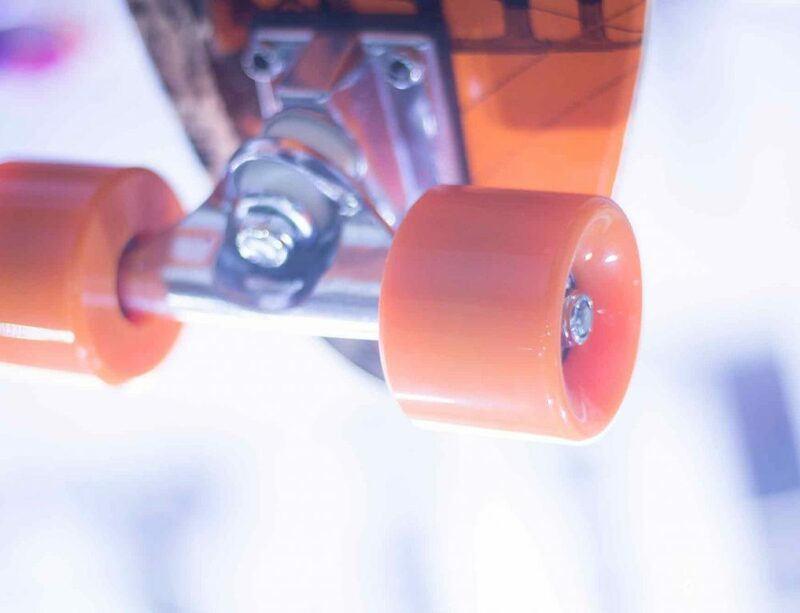 The protruding, angled lower lip supports your board by the truck, keeping it out of the way securely. 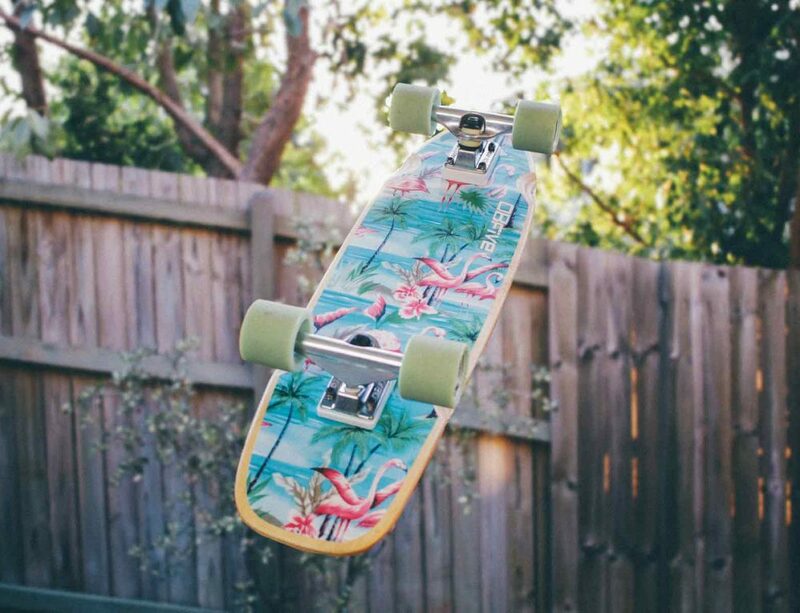 The minimalistic design ensures that any board can be protected, whether you’ve got a massive longboard or a diminutive penny board. Note that this wall rack requires that you have at least one truck installed to be used. All your mounting hardware is included, as well. Want something a bit sleeker and more stylish than wood or ABS plastic? We think the Source one Deluxe Tier Skateboard Display Rack does the trick. It’s made from durable, translucent acrylic, so you can always be sure that your boards are shown off to the best effect. The slots are wide enough to hold any board, and the system installs in just minutes. With a total capacity of four boards, you’ll find that you can store any type of skateboard you might have, from shortboards to longboards. Don’t need that much in the way of capacity? The manufacturer offers one, two, and three slot display systems as well, so you can get the perfect solution for your collection. Worried that you’ll receive your display rack and won’t be happy? The manufacturer stands behind the product with a 100% satisfaction guarantee. Note that this system can also be displayed on top of a counter, cabinet, dresser or other flat surface, and does not need to be wall mounted. Is your board a work of art that deserves all the attention it can get? If that’s the case, then you know how limiting some of those skateboard racks can be – they block the design, they cover up the aesthetic, and they break the overall connection with the art. 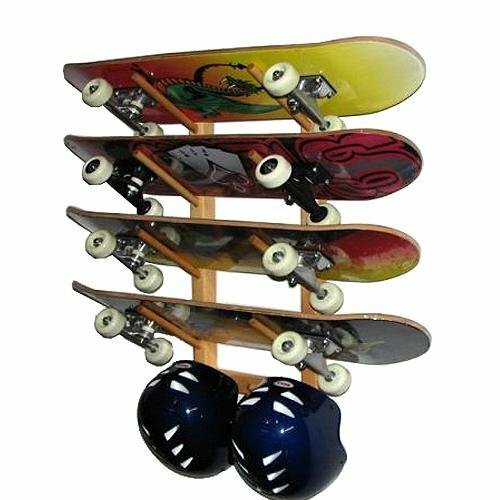 Enter Naked Skate’s skateboard storage rack, ideal for anyone who wants to make their board the focus of all the attention. This rack is made from 100% powder coated aluminum for the best in longevity and performance, and features felt padding on the arms to protect your board from scratching. The arms install very easily – just a couple of screws and you’re good to go. You’ll also find that there is amble room to store gear along with a board, helping you get everything organized and out of the way. Note that this wall display rack can be used with or without trucks and wheels. This product is also made in the USA. Want to find a way to get your board off the floor, but don’t necessarily want to hang it on the wall? If so, the Parking Block is the ideal option for you. 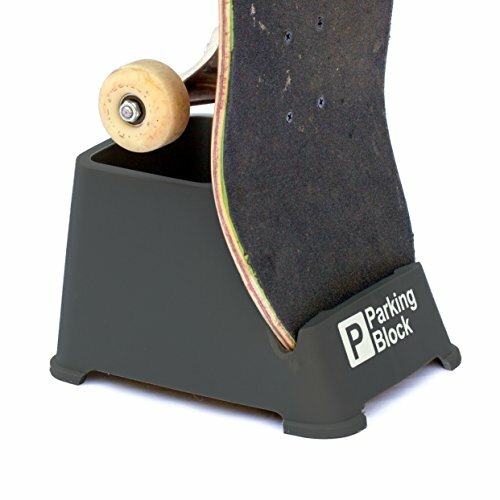 It’s designed from high-quality plastic, and will hold one skateboard, whether that’s a short or longboard. It doesn’t even need you to have your trucks and wheels installed, so it can be used with works in progress. There is a built in cavity at the back of the block where you can store accessories, and the block can hold your board vertically or horizontally. It does not need any sort of installation – simply set the block on any stable flat surface, and then add your board. That’s it! Note that because this rack can only hold a single board, you may need to purchase more than one to store multiple boards. Also note that some boards, notably pintails, may need to be stored horizontally rather than vertically. Designed and manufactured in California, this stunning rack is made from birch wood, and features tremendous storage capabilities. You’ll find a number of different iterations available from the manufacturer, including three, four, and six-board racks to fit your collection. The bottom of the rack offers two hooks so you can hang your helmet or other riding gear easily. There is also a convenient drawer at the base to hold spare trucks, wheels, and tools so you can keep everything all together. Assembly is required, but the only tool necessary is a Phillips head screwdriver. Mounting it to the wall is just as simple. Note that this rack can hold both regular and longboards, and all installation and mounting hardware is included. Also note that this rack is sold without staining – it can be left with a natural finish, or you can stain it to match your home’s décor. As you can see, there’s a skateboard rack for just about any need, whether you have a single “daily driver”, or you have a collection of multiple skateboards. Not sure how to make your choice? 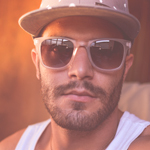 Let’s run through some of the more important considerations you will need to make. Perhaps the most important consideration here is capacity – does the skateboard rack have enough capacity for your needs? Alternatively, should you purchase a rack with more capacity than the number of boards you currently own? If you only have a single board, and anticipate buying another in the future, it might be wise to buy a three-board rack so you can store at least two boards, plus your riding gear. However, it might not make much sense to purchase a six-board rack if you only ever expect to own two skateboards. The material you choose is also very important. Each brings something different to the table. ABS plastic can be very durable and strong, but also quite affordable. Wood can be stylish and beautiful, and metal can be both modern and incredibly strong. Each option brings a different look, though. Perhaps the best option is to try to match the existing surrounding aesthetic. Of course, if there’s not much going on in the way of an existing style, then the sky’s the limit. How does the system mount? Is it wall mountable only? Can it only be mounted to the floor? What about limitations in your space itself – can you not locate a stud? Are you prohibited from mounting something to the wall? Do you have the floor space available? These are just a few of the considerations you’ll need to make when it comes to mount type. While all of the racks we’ve listed can be used with just about any type of board, that’s not true for all racks. Some are board style specific, meaning that if it is designed for shortboards, you cannot use it to store a longboard, and vice versa. Make sure that you buy a rack that fits your board collection and the types of boards you will add in the future. 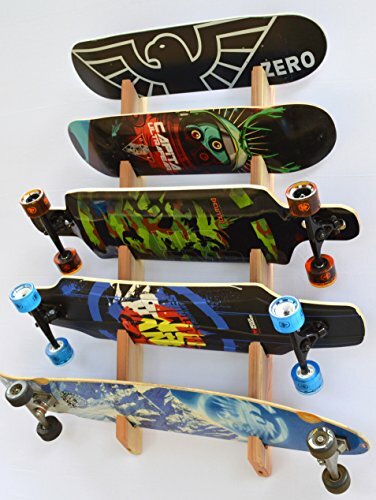 In the end, there is a skateboard rack for anyone, whether you have a single board, or a collection of several boards. Whether you’re looking for strong but affordable, elegant and durable, or a way to tie into your home’s aesthetic, you’ll discover a rack on our list that fits the bill.